Following the single greatest detrimental action to stock car racing in history … Will Brian France be suspended? Half of the NASCAR fanbase through a party yesterday. The weren’t celebrating the first win by driver Chase Elliott. They were celebrating a blunder by the now former NASCAR CEO, Brian France. Oldskool NASCAR fans hate Brian. They feel NASCAR turned their back on them and went a different direction, neglecting the fans that initially built the sport. Those fans aren’t wrong for feeling that way, it’s what happened. But, some are a bit saltier about it than others and most place blame directly at Brian France. What happened? Brian France blew through a stop sign on Sunday night in Southhampton, New York. He was pulled over and found to be intoxicated. He was then searched and found with Oxycodone. Mr. France spent the night in jail. He was released the next morning. 6 hours later, NASCAR announced an interim CEO. Jim France was selected by the board of directors to assume the role. The head of an automotive based sport was arrested for drunk driving. That sends a horrible message to middle America. This time bomb has been ticking for years. Those in the industry have all been told wild episodes of Brian France. This has been the rumor that we all knew was probably true but nobody had enough proof to type it. We ALL knew Sunday nights police report was coming. Back on November 6, 2006, Brian France was spotted driving erratically. A woman followed him back to his Daytona Beach condo and called the police. France crashed his Lexus sedan into a tree just outside his condo on Marina Point Drive. Police arrived at the scene 20 minutes later when France appeared at the door in new clothes. France admitted to having a few drinks at the Chart House earlier in the night. However, the police weren’t able to interview France until he was inside his residence. As a result, they couldn’t charge him with a DUI. The admittance to alcohol was removed in the official 2006 police report. Officer Chitwood stated that the reason it was excluded was because they were there to investigate a crash, not a DUI. “The bottom line is, he (France) was out of his car, he was inside his apartment and he could have had the alcohol there and hours before. But since we didn’t stop him in his car, we can’t touch him,” Chitwood said. On May 9, 2009, NASCAR driver Jeremy Mayfield was suspended indefinitely. He tested positive for methamphetamine. Mayfield took NASCAR to court. On July 1, 2009, a judge lifted the suspension. July 15, 2009, NASCAR announced that Mayfield failed yet another test. The courts let the suspension stand following the announcement of a second failed drug test. “Brian France out there talking about effective drug policy, it’s kind of like Al Capone talking about effective law enforcement,” Mayfield said in a 2009 interview. “And that’s the way I feel about it. The pot shouldn’t be calling the kettle black, you know what I’m saying? And I think the world needs to hear that, too,” Mayfield concluded. 9 years later, it would appear that Mr. Mayfield was correct. There were actually two moments. 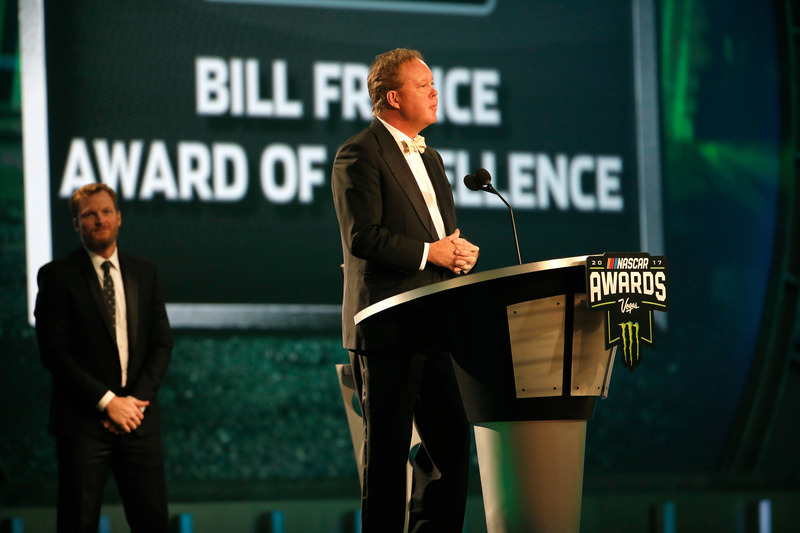 First, Brian France presented the humanitarian award from the stage with his family. While exiting the stage he tripped over his wife and they both tumbled. Later that same night, France introduced the 2017 NASCAR Champion to the podium at the NASCAR Awards show in Las Vegas. There was a brief intro given to the driver that dominated the 2017 season. Brian France walked over to Truex, handed him the championship ring and essentially sprinted off the stage. No handshake, acknowledgement or eye contact of any kind was made between the NASCAR CEO and the 2017 Champion driver. “I’ve been in a hurry all year, I guess,” Truex opened up his speech. Well, I guess that whole thing makes sense in light on Sunday night’s arrest. For the fans that stood and cheered yesterday, sit down. Nothing is going to change. Brian France hasn’t been to the race track regularly in years. With his label removed, Brian still has about the same level of involvement. “Brian’s probably doing what he needs to do while we’re over in the garage wondering if he’s even paying attention to the racing. We know what we’re after, but we don’t know what he’s after,” NASCAR team owner Richard Petty stated in 2016. Brad Keselowski mirrored those thoughts. As of Monday, Brian France’s name tag has been stripped and he has been indefinitely removed from the scene. They’ve now placed the formerly retired CEO into the same position, Jim France. Steve Phelps operates the business end of NASCAR. Steve O’Donnell manages the competition side of the sport. Literally nothing is going to change. What did Brian France do? He played a major role in courting Monster Energy into the sport. As NASCAR was seeking a new entitlement sponsor for 2017, Brian France actually reached out and personally visited Monster Beverage. I’d say Brian France played the biggest role in landing that new sponsor. 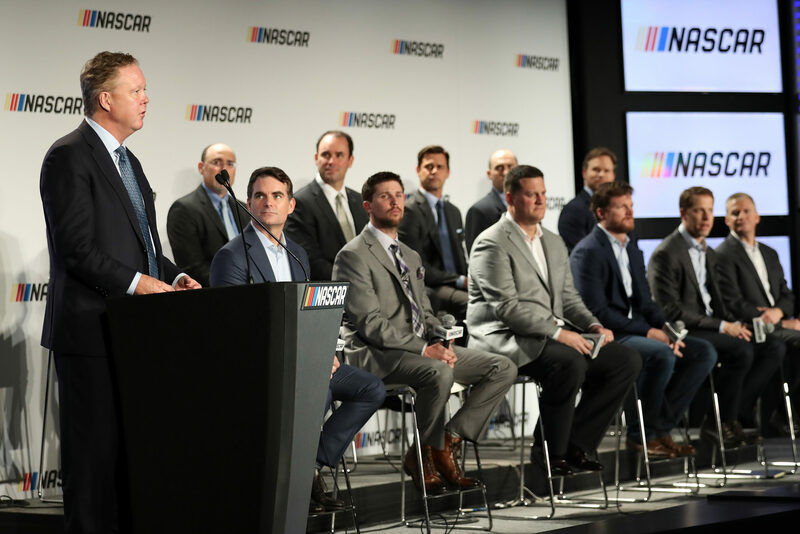 However, NASCAR is in the middle of restructuring the sponsorship program for 2020. Instead of one company at the top of the tier, they will have a handful. It puts less pressure to sign an entitlement sponsor as contracts expire. It would also appear that Brian France is involved in the courting of new automotive manufactures to the sport. That’s a huge deal for the health of the sport. When a new manufacture joins they pump millions into the industry as a whole. However, no new manufacture has joined the NASCAR Cup Series since Toyota in 2007. However, Brian France has stated that he’s been speaking with two. Those talks have been ongoing for several years at this point. Will Brian France be suspended today? NASCAR is expected to release their weekly penalty report later today. Will Brian France be listed on it? I guess, maybe. It would be incredibly inconsistent if they didn’t. But, it doesn’t matter. As I stated above, Brian France was minimally involved in the workings of NASCAR. To the point where he doesn’t even appear at the race track. NASCAR has their own Road to Recovery program which allows any NASCAR member that fails a test to be reinstated following a suspension. Ironically, France is the one that installed NASCAR’s substance-abuse policy. I still think they should do it. It’s not the job of the sport to sweep things under the rug. It’s their job to be consistent and set the standards. It’s highly unfortunate that the leader of the company went astray and tripped over his own standards. But, he should be treated the same as any other NASCAR member. I like Brian. I know the fans hate him. I can’t hate a stranger. I highly dislike his love of 1.5-mile tracks but other than that little stop sign, I like the guy. For the most part, I agree with the direction he steers his ship. Stage racing, the playoffs and a level playing field are all things that I like about the new NASCAR. These changes have been made under the influence of directors that France has put into place. I know the bulk of you disagree on every one of those items above. That’s somewhat evident as NASCAR attendance has dropped 50% since 2008. But, at the same time, the stats tell us without a doubt that NASCAR has never produced a better product on the race track. In my mind, it’s the tracks and competition for entertainment that have resulted in the bulk of the attendance decline. But, I still have a pulse of what fans complain about the most, they hate Brian. NASCAR needs to be the discussion around the water cooler, Brian France has single handedly taken care of that. Still, it’s hard not to show a thousandths of an inch in compassion department for a man that clearly needs serious help. Related: Is NASCAR for sale?